Art and photography related stuff. My primary memory of the year was relentless heat. I don’t cope well with summer at the best of times, but the heatwave lasted for most of it and continued into autumn. Heat has always been something that causes sensory overloads, which meant I was faced with months of endless sensory overload with very few breaks. The result was that I started the year doing things as expected and then pretty much everything stopped. My priority was simply to survive the heat. I spent time lying on the cold tiles, with trips to my room to change the ice for the animals. I couldn’t really focus on anything. The good news is I’ve found a decent mobile air conditioner that’d work for my room. The family have agreed to pool their money to get it as a birthday present next year. It’s expensive, but something that can be budgeted for, rather than expensive like a car. Going forward, I hope this means that I won’t be here again. But I was here this year. I lost a lot of time and have spent the winter scrambling to catch up. Early in the year, I published Werecockroach. It’s a science fantasy novella (and is eligible for any novella awards for the year, for those tracking such things). My aim was to make this more marketable than my other work. Not in the sense of following plot formulas or the like, but having things in the basic concept that might get attention. One being the whole idea of people turning into cockroaches. The other being own voices, which I discussed in the launch post. I was also aiming for something that was lighter, as when things get rough, it’s what I’d want to read. I wanted the most cozy alien invasion possible with a focus on friendship. The good news is the book has been selling. I ran some adverts as well as picking up some word-of-mouth recommendations on social media. Some months after release, it’s still continuing to sell in a way other books didn’t. The first reviews on Amazon and Goodreads have been positive. I am cautious about this success though, which comes down to my experience with own voices. My previous books came out just before the big push of #WeNeedDiverseBooks and #OwnVoices on social media. On the face of it, these looked like they should benefit a marginalised author. What actually happened is I didn’t have enough work that fit neatly. Things like recommendation requests increasingly moved to wanting own voices authors rather than marginalised authors. My work sank and I disappeared. Werecockroach was part of an attempt to reverse that, by finding an idea that could be marketed as own voices with an identity that got enough attention to be noticed (there are various aspects in the novella, but it’s the asexual lead that gets attention). It’s not really that this is better than my other work, but that it had hooks to promote. Which comes to the end of the year, where there was a discussion about optimistic fiction and hopepunk. I can see all the ways my books don’t fit it and that my life experiences don’t fit. Back when it was a few people discussing it as a few books, this didn’t matter much, because no book fits all genres. The problem is the shift towards the idea of it being an overall approach to writing stories of any genre and one that people ought to be doing instead of other approaches. I can see this becoming another own voices. Basically, something promoted as being to benefit marginalised authors, but acting as an additional obstacle for those who produce work that doesn’t fit. The basic problem is that things that can look like good ideas in basic concept, be it marginalised people talking about their own experiences or lighter stories for dark times, can turn into movements which are a bad idea. In other words, I have concerns about the goalposts changing and having to start at zero again with new work that fits the new criteria. I’m a slow writer, so it’s difficult for me to keep up with this sort of shift. My hope is that the novella will have enough of a boost to keep selling even if the landscape changes, but it could be an issue for whatever I write next. The year went well in terms of reprints. The first was in Transcendent 3, an anthology of trans and intersex stories edited by Bogi Takács. My story “Hello, World!” is about an AI taking fish to Mars. The idea behind the story was that learning AI is not neutral, but is informed by the training process and data sets. In this case, the people in the lab. So it’s not as obviously a story on the theme at first, until starting to think about who worked in that lab. This is also the first Patreon story that’s sold as a reprint. The second was the Japanese translation of the Fungi anthology edited by Orrin Grey and Silvia Moreno-Garcia. 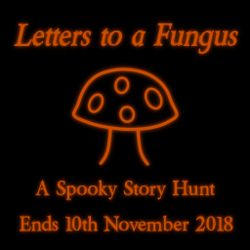 “Letters to a Fungus” is exactly what the story title suggests. Image Caption: Two paperback books on a white and silver cloth. One is Transcendent 3, which has a person wearing floral clothing scrubbing a brain with a sponge. The other is the Japanese translation of Fungi, which has a black cover with a gold/black flying mushroom machine with gears and tentacles. I also did my own little reprint of “Letters to a Fungus” in Second Life for Hallowe’en. It was arranged as a hunt, with each letter spread around an area. The most found letter was clicked 95 times and the least found was clicked 34 times. Trying to finish original fiction was more of a struggle. The stories I’d intended for Patreon didn’t get done, because I wasn’t writing at all once the heat came. Later in the year, there were two short stories deadlines I was trying to reach. One was for an anthology that hasn’t been announced yet. The other was a general public submissions call. I missed both deadlines, as I was trying to get back into writing at the same time as catching up with everything else, and sorting family things for the winter. It wasn’t the end of the world, because I do have some second chances. The unannounced project will have a public submissions call. It didn’t stop it being pretty demoralising, as I missed the chance of being involved at the earlier stages. But for the second deadline, I got an extension, and did manage to hit that. I felt a lot better after hitting the extension deadline, particularly as I wasn’t the only one who needed an extension. It’s easy to think that no one else is struggling if no one is being open about it, which is also part of why I write about the things I failed to do as well as the things that worked. Reviews stopped early in the summer. I do have notes I took before the heatwave and will get back into it. Interestingly, I still earnt money from the affiliate schemes, so the pause hasn’t been terrible. I can simply continue from where I left off as though nothing happened. Zazzle continues to be the main place where my art sells. My sales have gone up more than is proportional compared to the number of products I offer. About double the products has meant about four times the sales. There were no calamities this year and it’s something that continues to make money even when I’m not around. This time last year, I’d sent out art cards for Patreon. This has been delayed this year, so I don’t have the final art to show. The cards will be arriving sometime in January. I’ve also taken advantage of Patreon’s new system, where rewards can be restricted to a certain tier. I now have a “tank friends” tier, where I’ll post pictures and updates about my pets. This acts as a way for people with phobias, or who just don’t want pet pictures, to avoid this content. Patrons received an advanced copy of the novella this year and the art cards that will be arriving soon. I don’t usually include Wing Chun in my updates, as mostly I keep getting better at hitting people, so there’s not much to say. I did lose time this year, as I wasn’t able to get to training as often as I wanted. However, I did finally move from the beginner grades to the intermediate grades. I’d had issues learning how to fall without hitting my head, which slowed down my process. But I finally got it and can now be rugby tackled to the ground without knocking myself out, so there was much rejoicing. I can’t really talk about goals for next year without discussing Brexit. The UK leaving the EU could mean food shortages, medicine shortages, airports closing for months, loss of internet access, loss of power, and generally a lot of things that are going to make basic survival a lot harder. Family and friends on daily medication could die. There’s no way to make this sound better, because it’s not going to be good. This has already had an impact, because during my attempts at catching up in the winter, everything has been falling apart politically. This was the last thing I needed when I was already behind. It will continue to have an impact, because survival is going to come first. Next year will mean stockpiling supplies and an uncertain future. I do have plans for the year still. I’m hoping to publish Conduit, the sequel to my urban fantasy Sunstruck. It’s just this is going to be later than I’d hoped at the end of last year, because realistically, basic survival is going to come first. This means I can’t say what will happen. I might still be online and able to keep people updated. I might not. I just don’t know, so I hope people will have a little patience, as this situation is out of my control. For about four years, I’ve held off getting more animals, or really sorting my bedroom, because I was saving up for a fish tank. It hasn’t been the easiest time. I really like having animals. It’s a comfortable thing to look after them and watch them grow. It makes my room a space I can go when I need a break. But everything was on hold, because fish tanks are expensive. I stuck with looking after the hissing cockroaches I had and maintaining my little tank with three otos. My family helped out with that this year and I got a new community tank. The old otos were moved into it and I’ve since added zebra danios and more otos. Zebra danios are my favourite aquarium fish, so it’s great to have some again. The old little tank is now the quarantine tank. My tanks are all run as temperate tanks without heaters, and the fish choices are ones that prefer the cooler side of things (even though they’re usually sold as tropicals). This also opened up the way for sorting the furniture in the room (I have a couple of new garage storage shelves… they’re cheap, strong, and have big shelves) and getting some more animals (mainly woodlice and millipedes). A few days later, I was told that Boris was a good name for a spider, so I think a level of tolerance has been reached. A spider (Grammostola pulchripes) and a scorpion (Euscorpius carpathicus) were ordered and have now arrived, as this end of year post is a bit into the next year. I asked for the spiderling pot to be marked with “Boris” to help start the warm fuzzy feelings, so thanks to The Spider Shop for doing that! Image Caption: A small clear pot with white tissue inside. 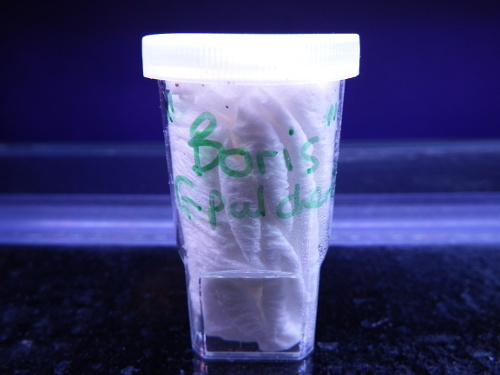 “Boris” is handwritten on the outside along with part of the scientific name. Out of everything this year, I really like how the room is shaping up. It’s already a much better space for me to relax. Once the air conditioning goes in next year, it’ll be ideal. It’s a lot like living in a cool temperate forest, which suits me perfectly. My plans for the year include adding in some low light plants, as well as continuing to stock the community tank and getting a few more invertebrates. Also, don’t panic about the critters and Brexit, because I can find food for them locally and excess from my colonies will be food for the predators, so they’re not going to starve. The planting in the fish tanks will act as a filter if the power goes out. They’re in a much better spot than the people in the house. I lost a lot of time this year to heat, though hope to sort it out next year with an air conditioner. Catching up with everything from the lost time has been a struggle and there are going to be tough times ahead with Brexit. My biggest success was publishing my novella Werecockroach. I’ve also been sorting my animal room. The second book in my urban fantasy series, Conduit, is expected out sometime next year, though when will be hard to say due to the political disruptions. It’s that time of year when things get spooky and people decide that bright orange is a great colour after all. The sim I live on in Second Life, Aquila III, has experienced an eldritch fungi invasion (it wasn’t me, honestly). In honour of this, I’ve put together a little story hunt. Ten letters are hidden around the area, with a few fungal prizes. For anyone still here, I’ll ramble a bit about what’s going on. The story is one that was published in 2012 in the Fungi anthology. “Letters to a Fungus” is exactly what it says: letters written to a fungus. I thought it’d be a fun story to turn into a hunt, as well as being an interesting way of telling the story. Each letter could be found in any order, meaning that it won’t be quite the same story to everyone reading it. The letters are also short, which is ideal for Second Life (no one really wants to read a novel in the form of Second Life notecards). 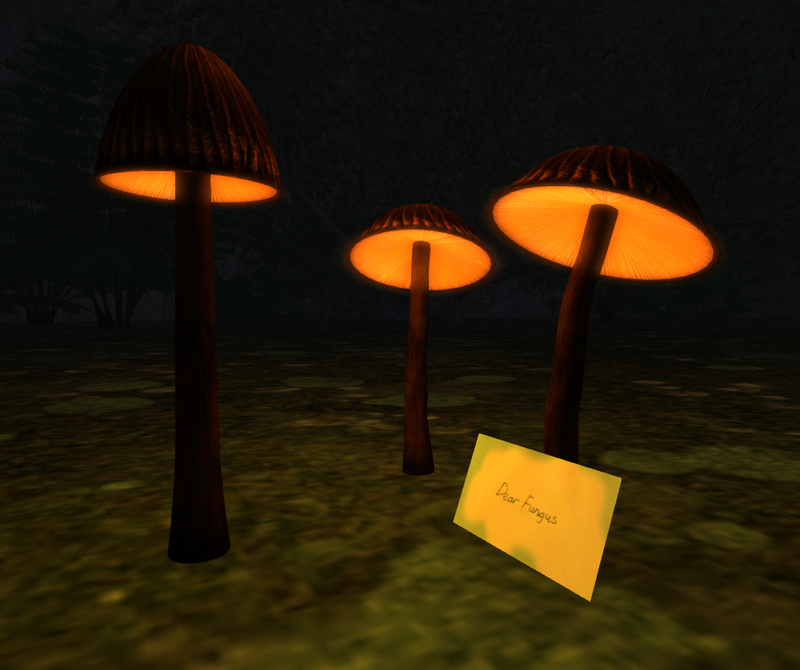 I created some new mushrooms for the event, including the orange glowing ones that mark the letter envelopes. These are prizes included with some of the letters. Finding the final letter also gives a new Shroomie (one of my tiny mushroom avatars). Image Caption: Three mushrooms are in darkness. The gills glow bright orange and the rest of the mushroom is dark. A stained envelope rest against one of the mushroom stalks and has “Dear Fungus” written in handwriting. This is the hunt item that people have to find. The sim has been decorated, so I suggest using the region settings. It’s currently dark and a bit foggy, which is the best for finding the glowing hunt items. You can also explore and see what has befallen the non-fungal residents of the sim. 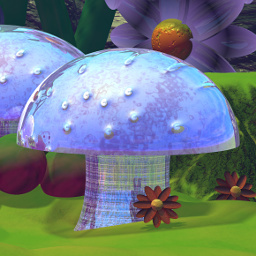 The event ends on 10th November 2018, when it’s predicted that the mushrooms will leave and the daylight will return. I hope you enjoy the story! I bought woodlice on a whim, as you do. This wasn’t quite as random as it sounds, as I do know the basics of looking after them, I already had the stuff to set up a basic tank, and I was thinking of maybe getting some millipedes. But instead, I ended up with woodlice. They have the advantage of being small, so it doesn’t take much space to have a colony. The first step was sorting out a tank. 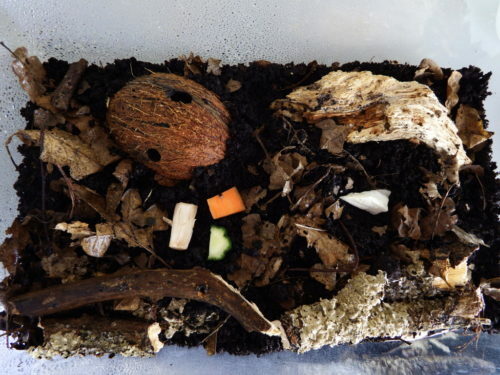 Woodlice need a humid environment, so it’s better to have a tank with less ventilation. Almost all of my tanks are the style with well-ventilated plastic lids. It’s debatable how much ventilation, but I didn’t want to go too low. Very low, such as just drilling a couple of holes, can run risks if fungi or bacteria get going. They’ll use up all the oxygen and the woodlice will suffocate. But my current lid was clearly too much the other way. 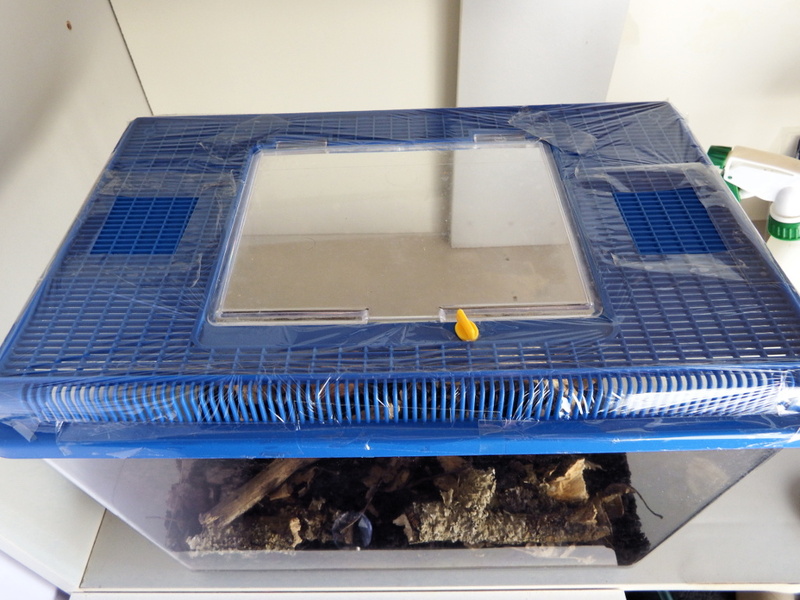 I used aquarium sealant to put some net curtain material on the underside of the lid (this is to discourage flies from getting into the tank). I made it bigger than I thought I needed, so I could adjust things with the next step. Then I covered the top with cling film, leaving two holes of about two inches square over the net curtain area. Image Caption: A view of the top of the tank. It’s a blue plastic mesh lid with a clear feeding hatch. Cling film covers most of the top. Two square areas are uncovered on each side, to provide ventilation. I had some organic compost lying around, so used that to make a layer of two to three inches. Then I covered it with leaf litter and old wood (I baked this before use). I drilled some holes in half a coconut and buried it slightly, so it would be a hide. At the last minute, I remembered I had a cuttlefish bone, so I threw a piece in as a calcium source. Image Caption: A view of the inside of the tank seen from above. Dark compost is covered in dead leaves and old wood. A coconut with two holes drilled is buried to the right side. The right side also has water droplets and a few pieces of vegetable (sweet potato, mushroom stalk and cucumber). On the left side, there is a white piece of cuttlefish bone, and there’s no water. 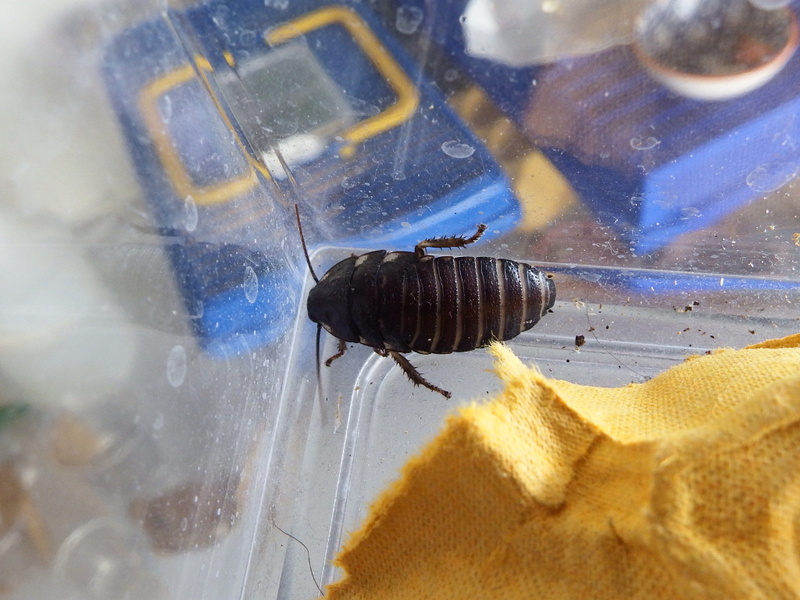 Then the exciting part: the woodlice arrived. I moved them out into a glass pot, so I could check they were fine and take a quick photograph. As they might be breeding, I wanted a record of my founders. The transfer went smoothly and they soon found hiding places. I did put a thin layer of Vaseline around the top of the tank, to discourage climbing. I’d heard conflicting reports about whether they could climb glass/plastic or not. As it turns out, this species really can’t. They were unable to climb the sides of the plastic pot they came in or the glass pot I used to transfer them. 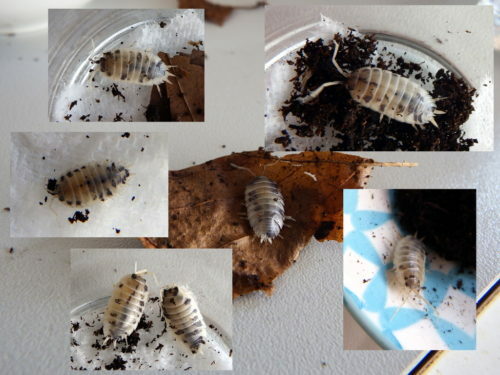 Image Caption: A collage of the seven woodlice, with some dead leaves, soil, and white kitchen roll in view. The woodlice are white with dark grey patches, especially near the edges of their body and in a line down the centre of the body. Some are a little brownish near the front, though others are more pure white. Each one has a unique spot pattern. I’ve been spraying one side of the tank only, near the coconut, to give them a moisture gradient. I sprayed the first few days, but I think the humidity is about where it needs to be now. I’m aiming to spray once or twice a week. If that doesn’t work, I’ll close the holes down a bit, but it looks like it’s about right at the moment. It was a tad hot the first few days, though I did see them sometimes at night. Today was a little cooler, meaning that I saw six of the seven out at once. The cuttlefish bone and algae wafers are the current favourite foods. 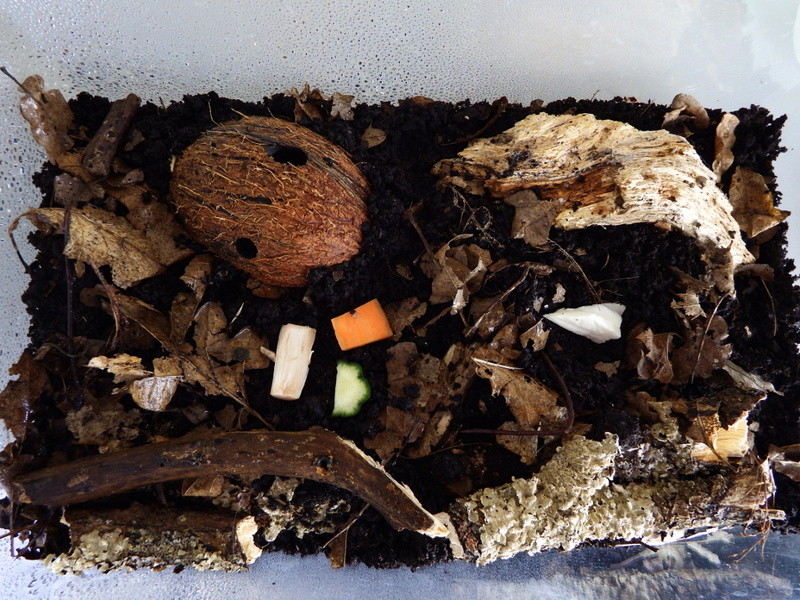 Now, it’s just about waiting for baby woodlice to appear. It’s baby cockroach time! I don’t breed my hissing cockroaches, so sometimes it’s time for some new ones. I ordered two and got an extra free. All of my cockroaches have come from Virginia Cheeseman. They’re always well-packaged and healthy, and I like being able to choose the general age (a lot of places only sell mixed tubs, which isn’t suitable for non-breeding pets). I also bought some woodlice this time, but that’s a tale for later. The first nymph has a slight kink in their antennae, but this shouldn’t cause them any issues. They’ll also get new ones when they moult. They’re one of those rarer few who like water enough to wade in it. Most of the cockroaches avoid going in the water at all, but I have had a small number before who will go in on purpose. They’ll only do that when it’s shallow enough that they can hold their abdomen over the water. This can also be filed under why I don’t worry about having open water bowls, because hissers are smart about water. I do use stepped reptile bowls, so they can easily climb in and out. 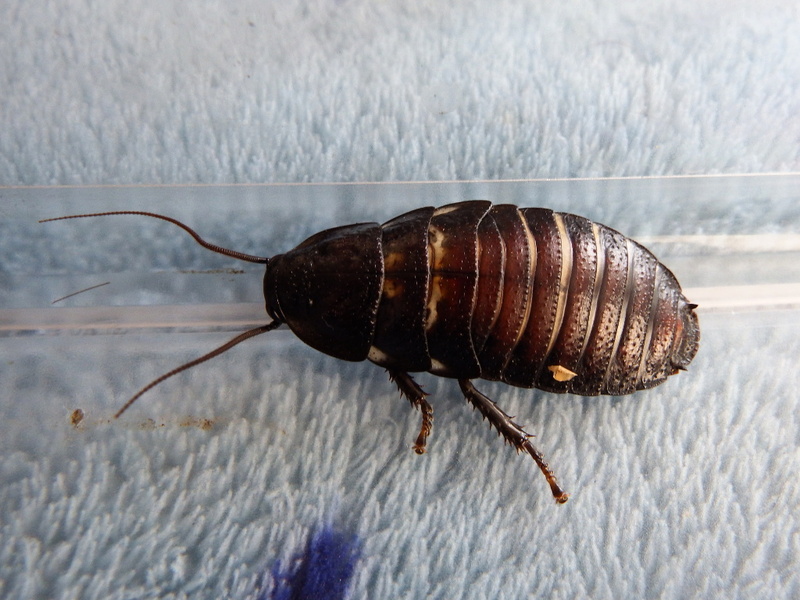 Image Caption: A top view of a hissing cockroach nymph in a clear plastic tank. They’re brown with some white at the edges of the abdomen segments. One antenna has a noticeable kink in it. The second nymph has been pretty average in behaviour and looks so far. They’ve spent most of their time in their egg box. 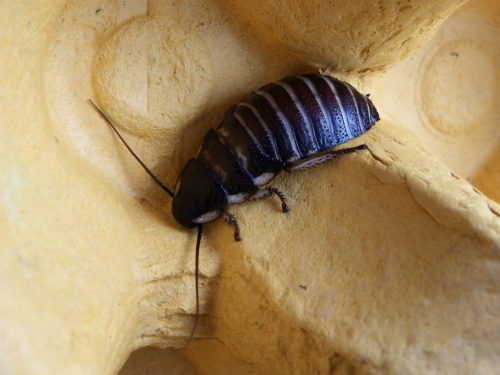 Image Caption: A hissing cockroach nymph on a yellow cardboard egg box. They look very similar to the previous nymph, but have more white on the top of their legs and straight antennae. And the third escaped. I always open packages over an empty tank, so that any escapees will just end up in the tank. This one had other plans. They jumped from the pot to my arm, then jumped to the tank wall, then went over the top. This is like being the jumping spider of cockroaches. Most just try to crawl out, rather than setting up a multi-point jump to get out. They’re not good jumpers, as they tend to make a rush for it and hope the momentum carries them, but it was enough to get out in this case. Image Caption: A view inside a set of drawers, with the drawers removed. 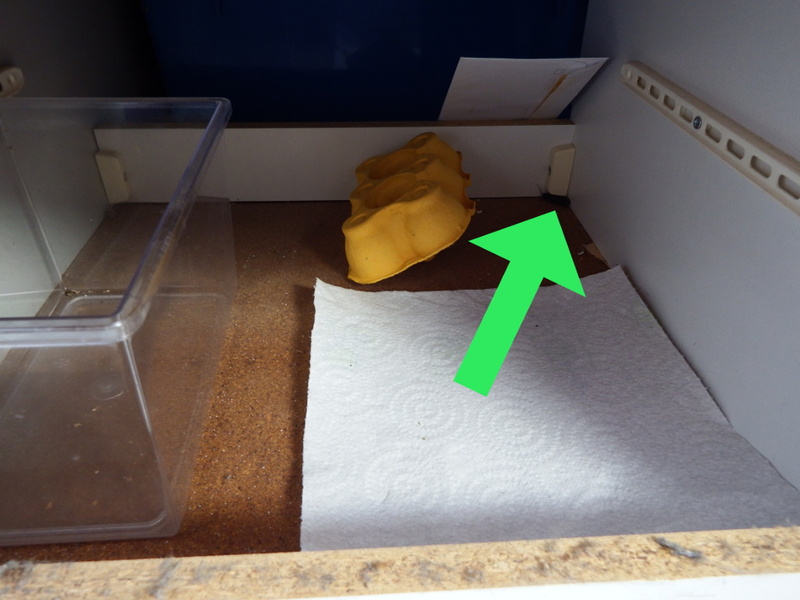 A plastic tank, egg box, and kitchen roll, have been placed on the floor in the space. An envelope leans up against the wooden board at the back of the space, making it harder for a cockroach to climb out that way. A green arrow points to the corner of the space, where a cockroach nymph is hiding. Before I could grab them, they climbed under the shelves under my bed. Fortunately, there’s a backing bit to the shelves, so they stopped at that point. I managed to coax them onto some kitchen roll and then got them in a tank. Image Caption: The escapee cockroach nymph in a plastic tank. They look much like their companions, apart from a layer of dust from running around under the drawers. The edge of an egg box is in view. Through the tank sides, two other plastic tanks can be seen. Excitement aside, all the nymphs are doing well. They’ve all been drinking water directly, which isn’t a surprise given the heat. I noted before that I have a lot of nymph pictures, but not as many of adults, so I will try to be better about photographing them when they’re older. They’ll most likely be a solid dark brown, as the white markings don’t last to adulthood. I haven’t named them yet. Suggestions are welcome! It’s the end of a difficult year, which looks set to become many difficult years. There’s been a lot of bad stuff going on politically. Some of it impacts me directly. Other things impact friends. That made it difficult to work, because anytime I did, something else would go wrong. That doesn’t mean that I did nothing during the year, but it does mean I focused on things I was able to do without having complete focus. Last year, I was looking at diversifying where I made money. This didn’t really work out, in the sense of the new things I tried didn’t generate money. I did see success in expanding some of the things that were already working. I’ll talk about that in detail, as well as a bit of background about some of my choices going forward. The quick summary version will be at the end, for those who don’t need the nitty gritty details. A piece of good news from this year is I now have a set of softboxes. These are lights for photography. Lighting has been a constant issue with my photography, as can be seen by the lighting issues in the various photos I’ve posted over the years (including the ones in this post, which were before I got the lights). The lights will be particularly useful for photographing larger art pieces. Writing was the area that suffered the most this year, as I need to be settled and able to concentrate to get things done. This is especially true for final edits. I had intended to publish Werecockroach, my science fantasy novella. But the struggle with the final editing meant it never quite got there. The second book in my novel series, Conduit, had a much better fate. I wrote quite a bit and sorted some timeline issues. Knowing that next year will be tough, I don’t want to be overly optimistic on release dates. I’m going to say it will most likely be released at the end of 2018 or the start of 2019. This means not a lot has changed since last year. I do intend to stick to a basic cycle of one standalone (either novella or novel) and one series book. My hope is that going for unusual concepts for the standalones might get people talking about them. In other words, I hope the gimmick makes people look. I don’t have a lot of hope for the current series, but I would like to have it fairly robust with a few books before moving on to a more marketable series. I did release a few new short stories on my Patreon, which is part of writing for the next collection. I don’t have a pending date on that, as it’ll happen when I have enough stories. I have art stores on Zazzle and Society6. Towards the end of the year, I had my first and only sale on Society6. I’ll still maintain that store, but it’s really all about Zazzle when it comes to actually making money. My aim for Zazzle was to reach a thousand products by the end of the year, which I hit sometime in autumn. Each design is on between ten to forty different products. I have seen results from this, with my sales going up overall. I was paid before the holidays and will be paid again in January. I expect quieter times at the beginning of the year, as people recover from holiday purchasing, but I’m generally optimistic about sales. I also tried out Zazzle’s embroidery system. This takes some investment, as the initial stitch files cost money (someone has to convert the image into stitches for the embroidery machine). I had one success and one failure. 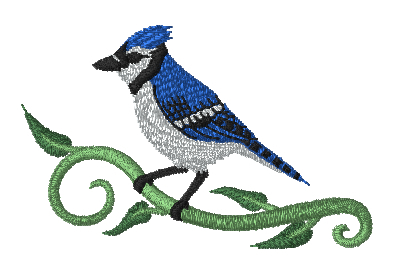 My blue jay design made a nice stitch file. I did edit it a bit before submitting it, to remove some of the fine detail, and it converted just fine. I sold a few things with it on, which paid back the stitch file cost. I’d likely have sold more, but Zazzle halted embroidery product sales for a short time due to the company moving to new premises. Image Caption: A preview of a stitch file, showing the stitch placement of an embroidered blue jay perched on a green vine. The failure was my pixel art mushroom. The resulting design had smooth lines, so didn’t resemble the original at all. The money was refunded, so nothing lost. Once embroidery production is running again, I’ll likely convert a smooth-lined cartoon mushroom design. Until the end of December, I was feeling stable about how things were going. Then the takedown notices started. The first was because I had textspeak that included u2 (as in “you too”) as part of the message. The concern was that it might look like merchandise for U2 the band. It’s over-cautious, but I could see they might be playing it safe. I deleted the couple of products with it on and went on with things. Then on Christmas, one of my pixel mushroom products was taken down for copyright/trademark infringement. This is an original design and has been picking up sales, so this was much more of a concern. I responded. A few days later the product was put back. I’ll never know exactly what happened. I know some people do targeted reporting around holidays to attack people, so it’s possible that happened. It does have a feeling of someone mass reporting everything to see what would stick, especially with the timing. Needless to say, that was all pretty stressful, but I’m glad the pixel mushroom is back. Reviewing has stayed about the same this year. Views have gone up a bit. I’m seeing more review requests coming in, which is a good sign that the blog getting some wider attention. The money earnt from Amazon Associates is about the same. What hasn’t been so good is the mainstream book problem. I picked a fair few mainstream books when requesting thing to review. This has logical reasons behind it, as these books are the ones that initially get people to the blog. I also found I could link up these books with smaller titles by running themed Twitter threads of reviews. This raised the views on reviews of those smaller titles. All of that is fine, but the chances of disliking those mainstream books was a lot higher. Such books are often good at that one area that matches the author’s identity, but offers plenty of punches to the face to everyone else. The sort of work I’m really hoping for, with a wider intersectional perspective, is difficult to get in those big titles with all the hype. It doesn’t help that books that get hyped in the online book communities often get aggressively defended. I’ve mostly got away with it because my reviews are often a bit after the release date, so things have calmed a little, but I won’t stay lucky forever (I’d note that this sort of attack is still peanuts to the whole death threat thing of my old blog content, but I’d still rather not have the drama). It means I’ve learnt to pay attention to some other book bloggers in the worst possible way: if they love a book, it’s one to avoid reviewing. There’s a silver lining to all this though, because those popular mainstream titles continue to get views long after the initial review. So next year, I’m going to take a bit of a break from popular books, and rely on the views from my older reviews. I’ll continue reviewing titles that I’ve already agreed to review. Anything new I pick up will be titles I’ve chosen and titles that come through authors sending review requests. I’ll make exceptions for something on the hype train that looks totally my thing, but the odds of that are pretty low. I’m open to suggestions of books that people think I’d enjoy and they’d like to see reviewed. I did a book bingo of things I’d like to see in representation, and I’d mostly like science fiction and fantasy where romance isn’t the main focus. Basically, it’d be nice if I could have a year where reading is fun. Patreon has continued at about the same level as before. I’m now a few pledges above my website bill, so there’s a little more safety. Until the end of the year approached, I’d have said it was stable. Then there was a sudden announcement of fee changes that would have forced a lot of my patrons out. Patreon did change it back, but it meant uncertainty about whether it would continue to be viable. It’s still possible some people will leave, due to losing trust in the platform. This is my least favourite way of generating money, because producing masses of content each month is considered normal for the platform. I can’t work that quickly, especially when it comes to writing. Being dyslexic does slow me down, but it happens in a way that isn’t obvious to outsiders. They see that I can write fluently, so assume it isn’t like trying to float rocks with the power of my mind to get my writing to that state. I did try some ideas this year to counter that. One was a few work-in-progress posts. These didn’t generate any interest, so I don’t intend to do more of those (they still take time to put together, which I could spend on other things). Another was to make a special reward for the end of the year, which was generally well-received. 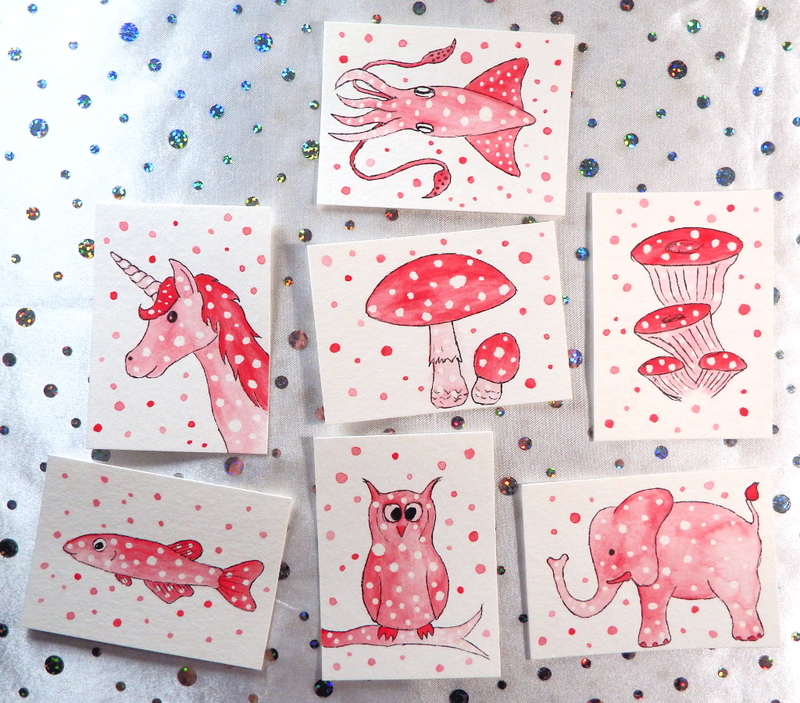 I painted a series of art cards and sent one to each patron. Given that I had seven patrons at the time, this sort of personal reward was viable to do (I wouldn’t be painting up a hundred individual art cards). 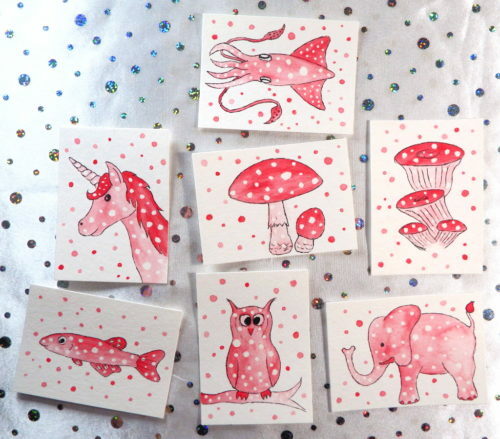 Image Caption: A set of art cards for Patreon, displayed on a white cloth with silver spots. The series has a central figure drawn in black ink. The figure is red with uneven white polka dots, painted with red watercolour. The background is white with red polka dots. The subjects are: a squid, a unicorn, an owl, an elephant, a leopard danio fish, oyster mushrooms, and a fly agaric mushroom. Click for a larger version of the image. My general conclusion is that Patreon is not a good platform for me. I’m better at producing occasional big rewards, rather than multiple smaller rewards. My regular content is my reviews, but few people see the reviews as a reward. However, I don’t have a better alternative, so here I am. One thing I tried last year was a new wishlist. This went about as well as last time: only family bought things from the list. I removed most of the links to it, on the basis that a static wishlist is a lot like a news section that never updates. It creates the impression of being inactive. I know wishlists work well for some reviewers, as a way to get books that otherwise can’t be requested. It didn’t work out for me. The list is still there and public, so I have it should there be a need for it sometime. I’ve tried to keep my Twitter account on the light side this year. I figured people would see the news, so they didn’t need me to be the news. I posted my baking from Hallowe’en and the winter holidays, along with updates about the birds and pets. It’s been a difficult year for writing, as I need a calm environment to work on it. The novella Werecockroach will be out next year. The second book of the Bigfoot Mysteries, Conduit, is aimed for the end of 2018 / start of 2019. It was a good year for art, with my sales at Zazzle increasing. Patreon is about the same and I gave art cards to my patrons at the end of the year. I had a scare with both Patreon (with sudden fee change announcements) and Zazzle (multiple product takedowns), which demonstrates why I’m always looking for other sources of income to add to the mix.